Camille Abily and Dzsenifer Marozsán lift the Champions League trophy after defeating Wolfsburg, 4-1. Lyon players celebrate winning the 2018 Champions League title. Packed house to watch the 2018 Champions League final between Lyon and Wolfsburg. Lyon's Eugénie Le Sommer reacts to missing a shot during the 2018 Champions League final. Lyon's Dzsenifer Marozsán prepares to take a corner kick. Amel Majri on the attack for Lyon. 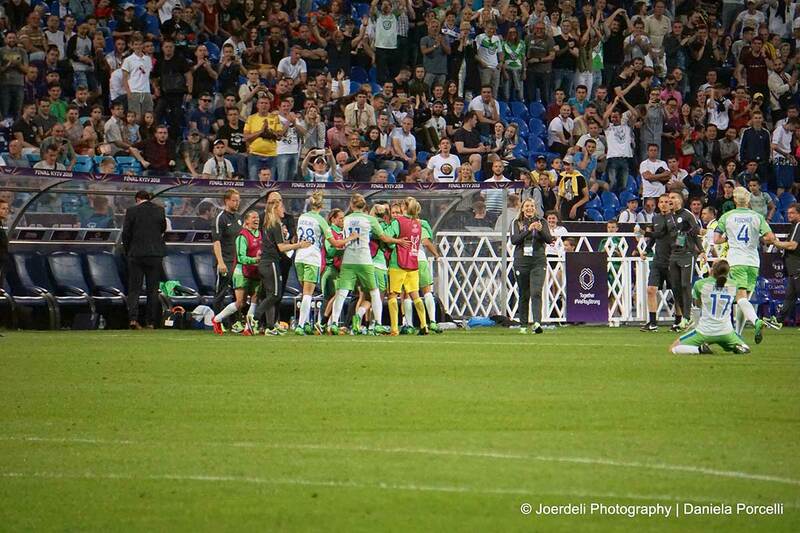 Wolfsburg celebrates Pernille Harder's goal in the 2018 Champions League final. Lyon celebrates getting the equalizer during the 2018 Champions League final. Ada Hegerberg and Lyon celebrate her goal in the 103rd minute of the 2018 Champions League final. 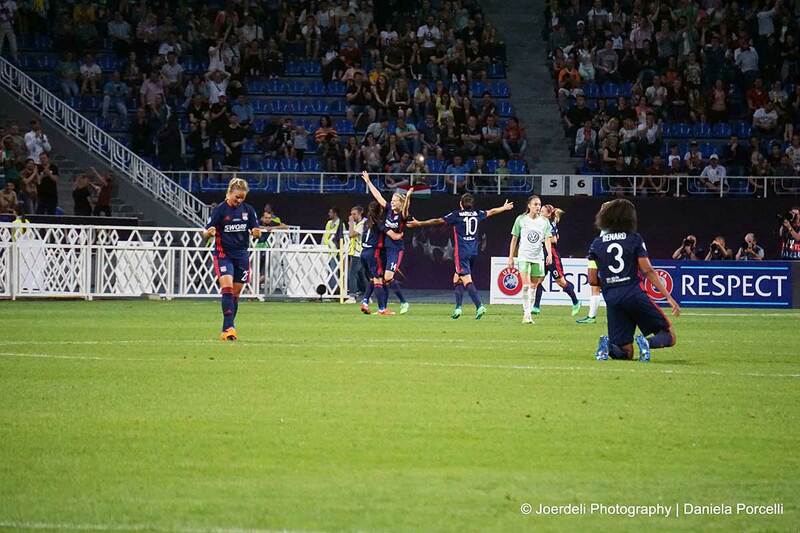 Lyon's Wendie Renard and Wolfsburg's Pernille Harder. Gutted. Lyon celebrates during the 2018 Champions League final. Wolfsburg's Lena Goeßling after the 2018 Champions League final. Alexandra Popp after accepting her runners-up medal after the 2018 Champions League final. Olympique Lyon, winners of the 2018 Champions League title. Slidin' into your DMs as Champions League winners. 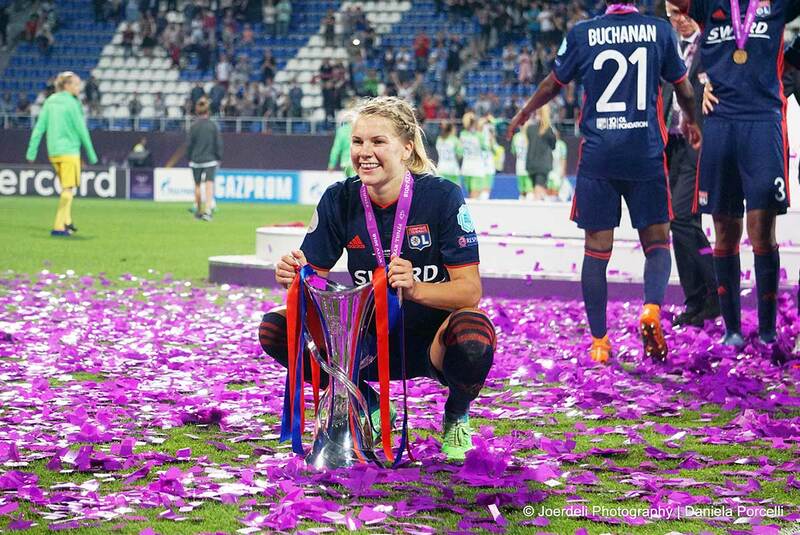 Ada Hegerberg with the 2018 Champions League trophy. Eugénie Le Sommer with the 2018 Champions League trophy. 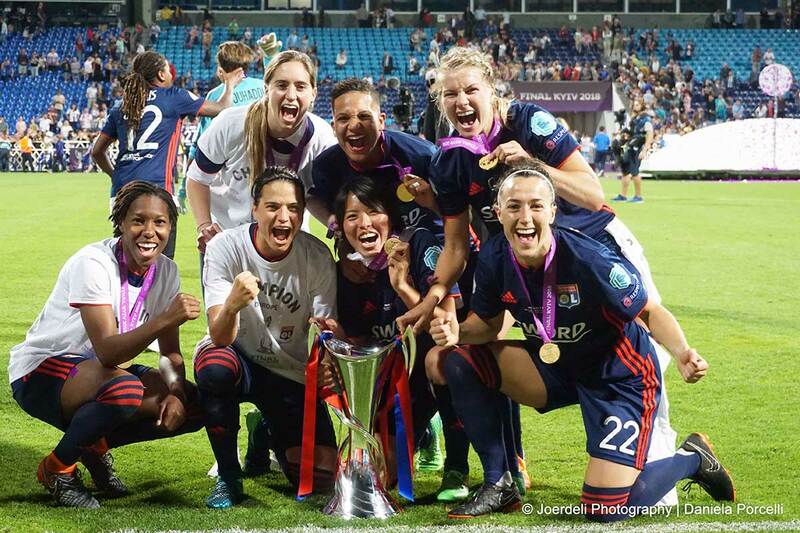 Olympique Lyon won a record fifth UEFA Women’s Champions League title with a 4-1 win over VfL Wolfsburg on Thursday, May 24. 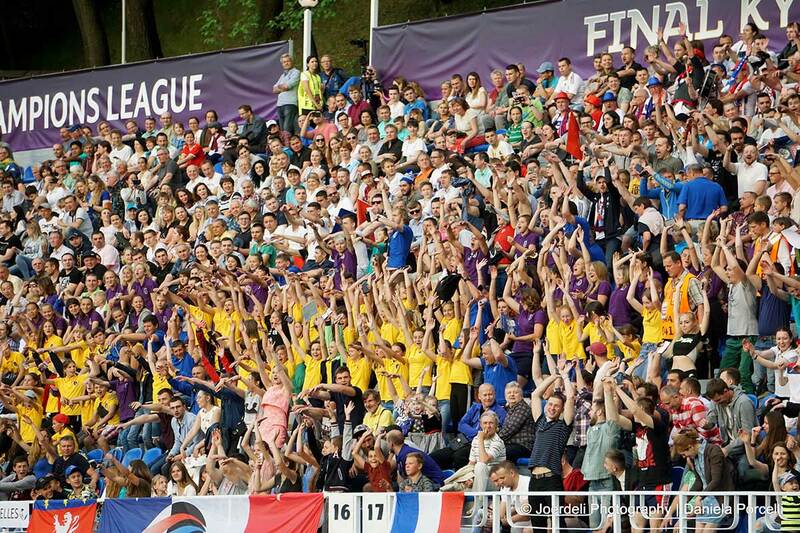 The crowd of 14,237 at Valeriy Lobanovskyi Stadium in Kyiv, Ukraine, watched as Lyon captured its third consecutive Champions League title. 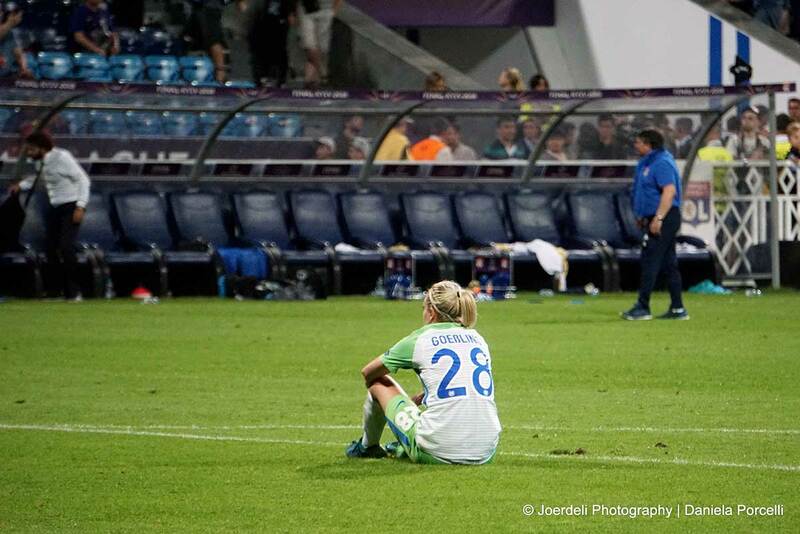 Wolfsburg struck first, in the first period of extra time after regular time ended knotted at zero, off a deflected Pernille Harder. 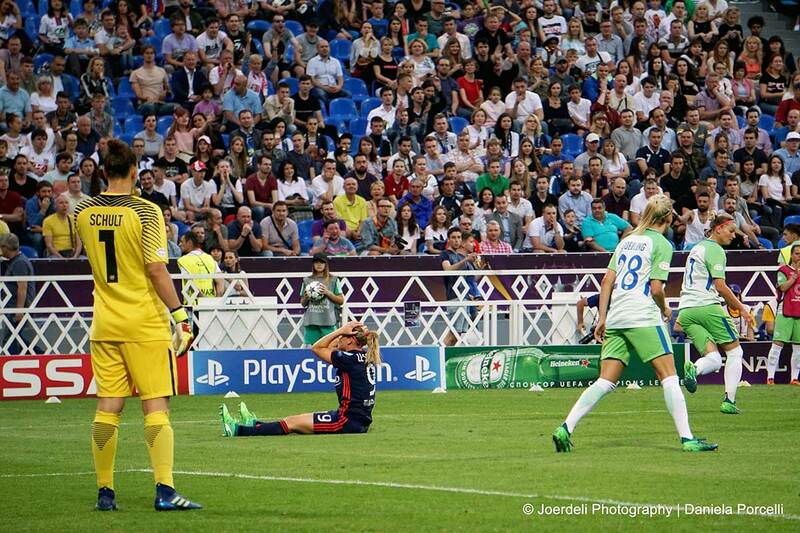 Lyon’s Amandine Henry equalized two minutes later with a strike to the top corner. 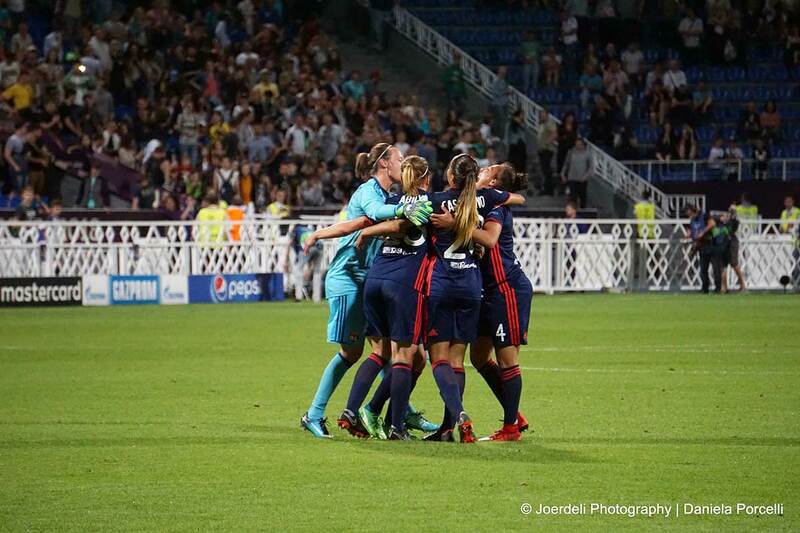 From there, it was all Lyon: Eugénie Le Sommer put the French side ahead roughly a minute later, Ada Hegerberg doubled the lead with her record-breaking 15th Champions League goal, and legend Camille Abily added one in her last appearance for Lyon. Lyon’s win broke a deadlock with Germany’s 1. FFC Frankfurt for most Champions League titles. Frankfurt’s previous titles came in 2002, 2006, 2008, and 2015. Lyon’s previous titles came in 2011, 2012, 2016, and 2017. All images courtesy of Daniela Porcelli. 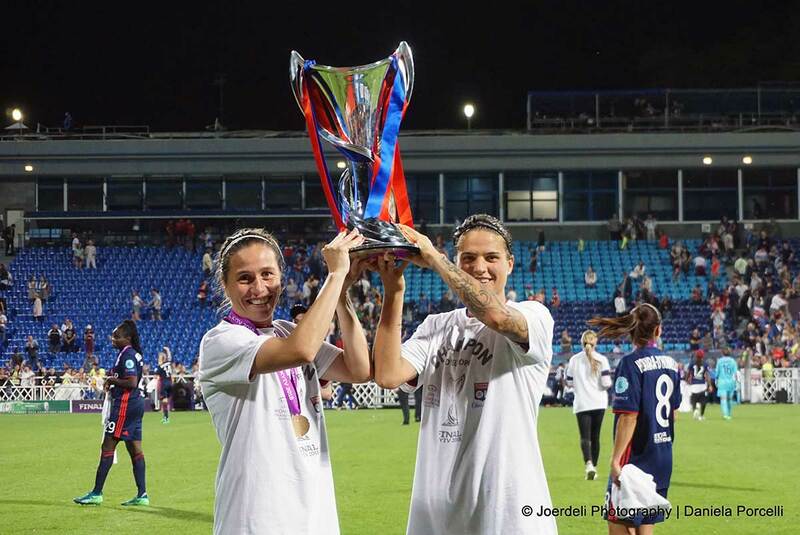 Camille Abily and Dzsenifer Marozsán lift the Champions League trophy after defeating Wolfsburg, 4-1. Lyon players celebrate winning the 2018 Champions League title. Packed house to watch the 2018 Champions League final between Lyon and Wolfsburg. 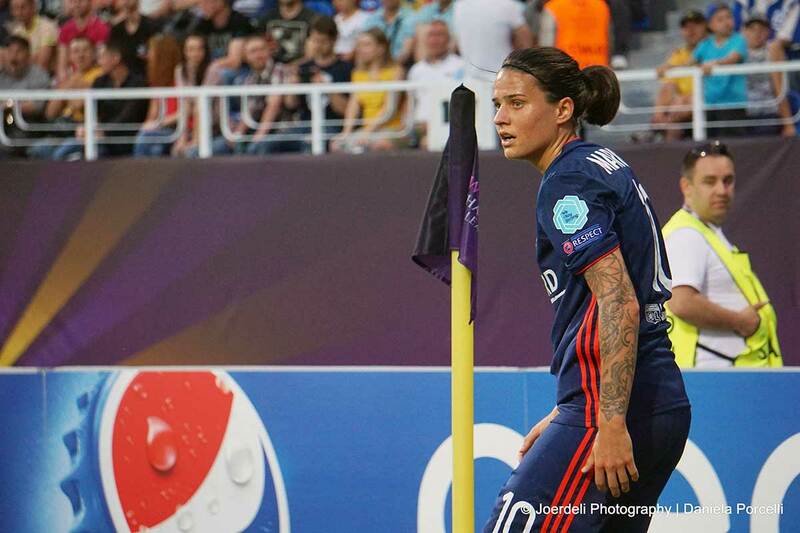 Lyon’s Eugénie Le Sommer reacts to missing a shot during the 2018 Champions League final. Lyon’s Dzsenifer Marozsán prepares to take a corner kick. 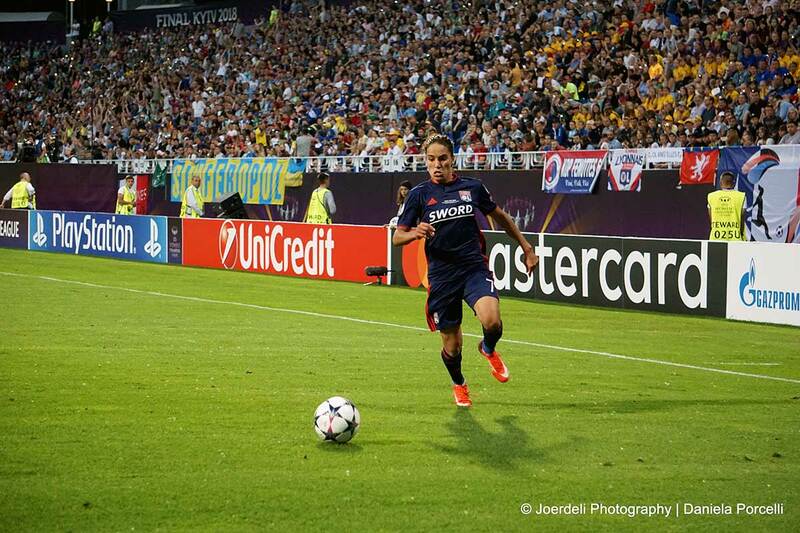 Amel Majri on the attack for Lyon. 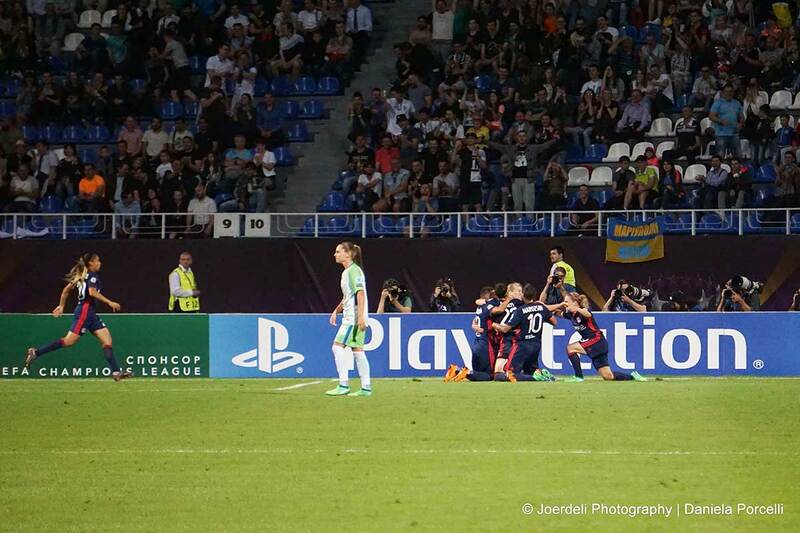 Wolfsburg celebrates Pernille Harder’s goal in the 2018 Champions League final. Lyon celebrates getting the equalizer during the 2018 Champions League final. Ada Hegerberg and Lyon celebrate her goal in the 103rd minute of the 2018 Champions League final. 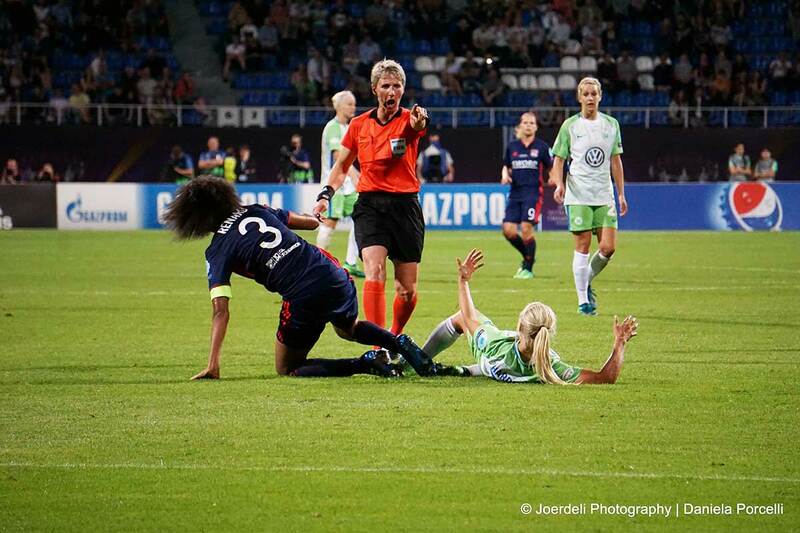 Lyon’s Wendie Renard and Wolfsburg’s Pernille Harder. Lyon celebrates during the 2018 Champions League final. Wolfsburg’s Lena Goeßling after the 2018 Champions League final. 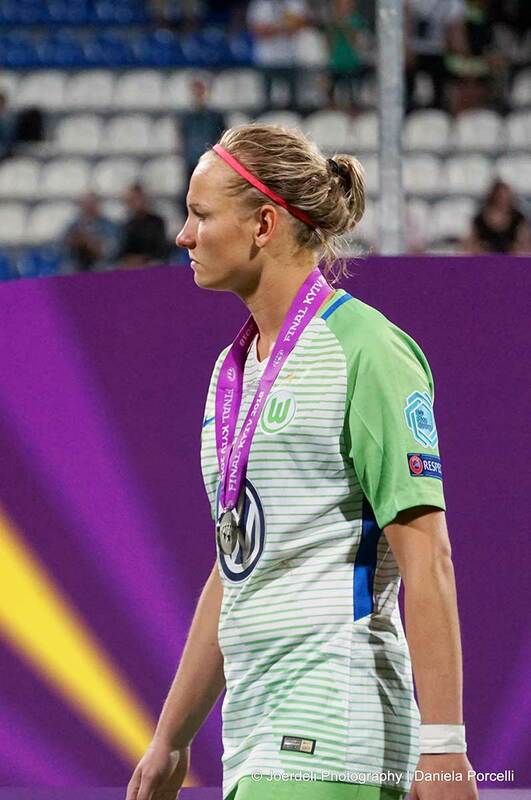 Alexandra Popp after accepting her runners-up medal after the 2018 Champions League final. 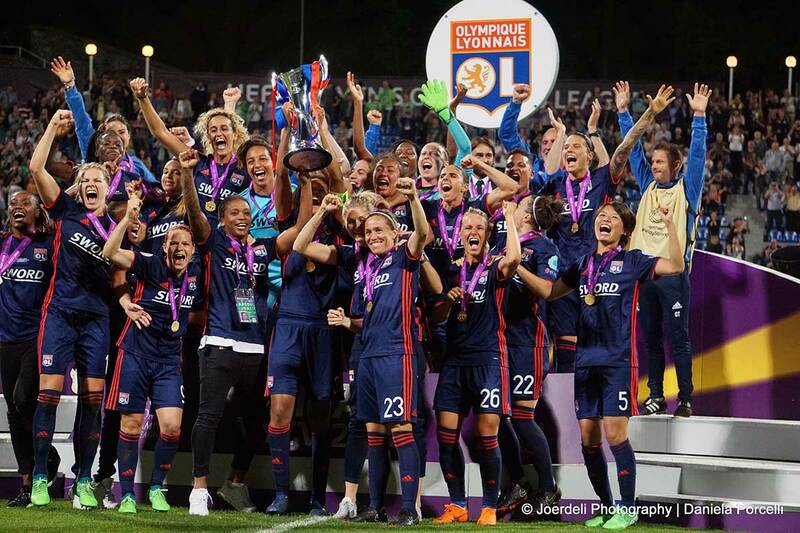 Olympique Lyon, winners of the 2018 Champions League title. Slidin’ into your DMs as Champions League winners. Ada Hegerberg with the 2018 Champions League trophy. Eugénie Le Sommer with the 2018 Champions League trophy.